HomeOpinionShould colleges stand by the USI? The motto of the Union of Students in Ireland is “together we are stronger”, but following the results of a recent referendum, UCD students don’t seem to think so. 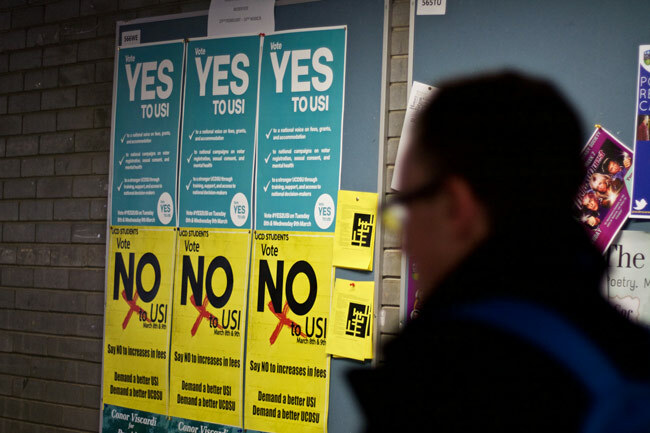 Last week, UCD students voted against rejoining the USI by an overwhelming majority. The 74 per cent of students that voted ‘No’ did so because they felt that a list of reforms needed to be enacted by the umbrella union before they considered re-affiliating themselves with it. While the overall turnout of voters in this particular referendum was substantially low, with just 2,921 students out of 32,387 coming out to vote (excluding spoiled votes), it is still a massive blow to the Yes campaign, as students have made it quite clear how they feel about the USI and its manifesto. The USI considers themselves a democratic body. However, they fail to democratically elect their president, which is something that the No campaign in UCD felt issue with. If a body is fully committed to representing a group of students in Ireland, then it should be only common sense that those students get to decide on who should serve as their voice. The USI’s refusal to make their financial documents public is another factor which has pushed forward the ‘No’ vote in UCD. UCD’s Students’ Union has been suffering financially recently, and one of the reasons they left the USI in the first place was due to the national union’s monetary struggles. With UCD being the biggest university in the country, their membership in the USI would make a huge difference to the national body. The USI is important, but as far as UCD are concerned, they need to make several changes. As for smaller colleges around the country, the USI is important as it gives them a voice which may not have been heard before. It is refreshing for young people in Ireland to have a body that can represent their views, especially seeing how proactive the USI were in the marriage equality campaign, and their dedication in raising the minimum wage for student nurses. It’s quite clear that the national union do represent our views best, but it is just the technical issues behind the scenes that need to be tweaked in order to gain full support of all colleges. I believe that all colleges would be in favour of the USI if it was based on the umbrella union’s beliefs alone. If the USI were to consider some of the reforms set out by UCD, then it would be very beneficial to have the university back as a member. We are very lucky to have a national body representing the youth in Ireland in regards to issues we care about, such as repealing the 8th, student loans and marriage equality to name a few. The traditional Government can often appear unhooked to the youth in Ireland, and our voices and the interests we stand by can often go unheard. This is why I believe the USI is important, and that colleges around the country should stand by it. However, I don’t agree that the national body is perfect, and as it describes itself as a democratic union, it should definitely consider the interests of all of its members and those they wish to join their team.